Obama’s plundering of the office of president continues unchecked and unabated. 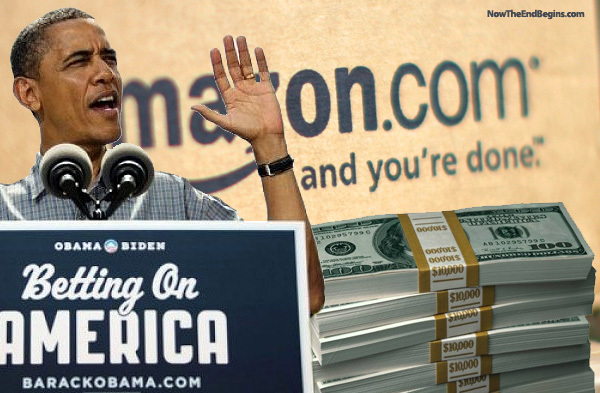 Not only does Amazon peddle Obama’s books, but its Amazon Web Services helped build the high-tech data storage and retrieval system for the Obama campaign’s get-out-the-vote operation. “During the campaign, the AWS solution helped facilitate the fund-raising of hundreds of millions of dollars, prioritized millions of phone calls and coordinated thousands of volunteers,” Amazon boasts on its Web site. Amazon has helped Obama in other ways, as well. Before Obama’s speech about his economic plan at an Amazon.com warehouse in Tennessee, the company announced it was hiring more than 5,000 new full-time workers at its warehouses across the country. The move will increase Amazon’s workforce by about 25 percent, as it expands its network across the country and strengthens its control of the online retail marketplace. Obama’s appearance on Amazon served as a ringing endorsement at a time when traditional publishers are balking at the company’s virtual online monopoly. Amazon also discounted Obama’s books on the day of the speech and offered customers “super-saver shipping” if they ordered within six hours of the discount, the Washington Times reported. The price of the paperback version of Obama’s 2004 book, “Dreams from My Father: A Story of Race and Inheritance,” was slashed from $14.95 to $10.76. The discount was expected to jump-start sales of Obama’s one-time best seller. However, Obama’s exclusive interview for Kindle Singles flopped with most of the megaretailer’s online shoppers. By late afternoon yesterday, more than half of the reviews posted on its Web site had panned the interview by Kindle Singles editor David Blum. Of 87 reviews, the Obama interview got the lowest rating of one star from 52 readers, compared with 28 who gave it the highest five-star review, and five who checked four stars.